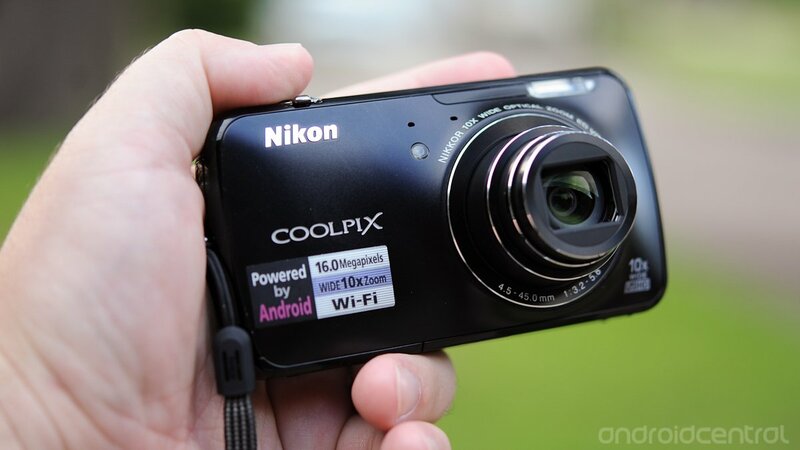 We're going to do up this Nikon Coolpix S800c -- aka Nikon's Android-based camera -- a little different. Mainly, I'm going to walk through the hardware, Android software, and the camera software separately. That's for a couple reasons, but mainly so that I won't let the wonk overshadow what's good about this little point-and-shoot. First, though, a quick reminder on specs. What we've got is a pretty standard-feeling point-and-shoot. It weighs about 6.5 ounces with the battery and an SD card installed. It's got a lens that ranges from 4.5 to 45 mm, f/3.2 to f/5.8. It's a small little guy. It's also got a 3.5-inch OLED touchscreen on the back and a 480x854 resolution. There's about 1.6GB of on-board memory, but you'll be sharing that with the operating system, so you'll want to consider an SD card. The phone camera has about 248MB of RAM, according to a quick peek with a system info app. For all intents and purposes, this thing feels like a point-and-shoot camera. The body of the S800c is plastic. And it feels like plastic. And the buttons are exactly where you'd expect them. The shutter is big and easy to feel out. The zoom rocker is on the front edge of the shutter button, and you might have a hard time reaching it because of its proximity. The on/off button's on the top edge as well, and it's got a a small LED in the middle of it, showing when the phone camera's in standby or is charging. The built-in flash is smartly designed. It doesn't pop up or anything. The lens extends with the usual mechicnal whir, but it's not too loud. When it's retracted, the lens itself is protected with one of those little automatic sliding doors -- again, exactly what you'd expect from a $300 point-and-shoot camera. On the bottom you'll find the standard threaded connection for tripods and the like. There's a sliding door down there for the SD card and the 1050 mAh battery. The SD card is spring-loaded, while the battery is held in by a small, orange, spring-loaded clip. The S800c comes with a charger and USB cable (it's USB 3.0, by the way). The USB and mini HDMI ports are on the right-edge of the camera, flanking the wrist strap connector. The wrist strap is pretty basic, and it lacks a tensioner, so it's going to flop around on your arm, which is a shame. Other items of note in the hardware department: Wifi and GPS are a go, as is Bluetooth. So, yeah. It's a point-and-shoot. With Android. The hardware is predictable. The Android operating system -- and, of course, the camera software and how well it takes pictures -- are what we're really interested in. And they're coming up next.